Jet Airways has received its fifth Boeing 737 MAX, as part of its fleet modernization plan in line with its commitment to offer its guests a considerably superior and differentiated flying experience. Since the induction of the airline’s maiden 737MAX (registered as VT-JXA) on 28th June, 2018, another four _ have joined its fleet. 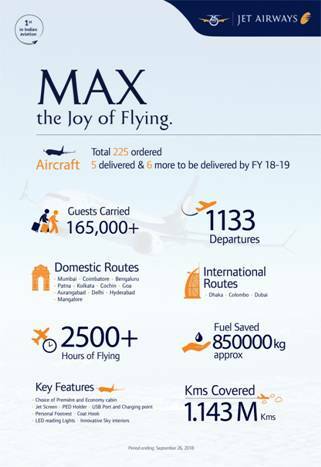 The latest MAX – the airline’s fifth, with registration VT-JXE – is part of 11 MAX aircraft that Jet Airways will be inducting this fiscal year. Another 220 MAX aircraft are expected to join the airline’s fleet over the course of the next decade, as it expands its footprint and refreshes its in-flight experience on the back of a completely modern and contemporary product. Jet Airways remains the first and only Indian carrier to operate these advanced single-aisle fuel-efficient aircraft in the Indian skies.